Jennifer Brown, the executive director of the Flatiron/23rd Street Partnership Business Improvement District (BID), will soon be leaving her post after more than a dozen years of service. In an announcement last week, Brown said she will begin work next month as executive director of the Montclair Center BID, working in the area where she and her family have lived since she’s been commuting to Flatiron. The BID has not yet begun searching for her replacement. This week, Brown spoke with Town & Village about the ways the Flatiron neighborhood has changed since its BID was formed in 2006, from rising commercial rents to the influx of many families. During Brown’s tenure, neighborhood public safety and clean team programs were launched, servicing Flatiron seven days a week. The Flatiron pedestrian plazas were also created in 2008, which the BID maintained. 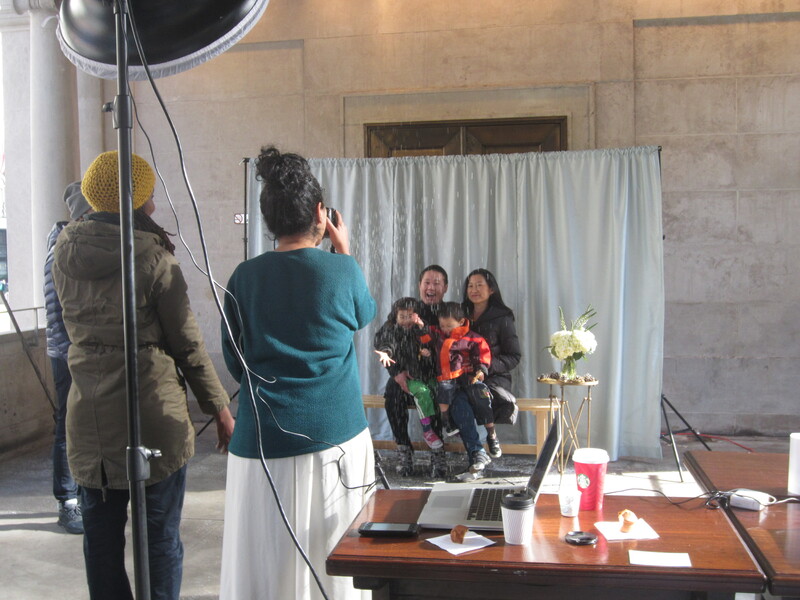 The holiday season “23 Days of Flatiron Cheer” programming was also launched along with free summer fitness and tech classes, ongoing speaker events and business assistance forums as well as other events. The neighborhood has also been promoted through marketing campaigns. 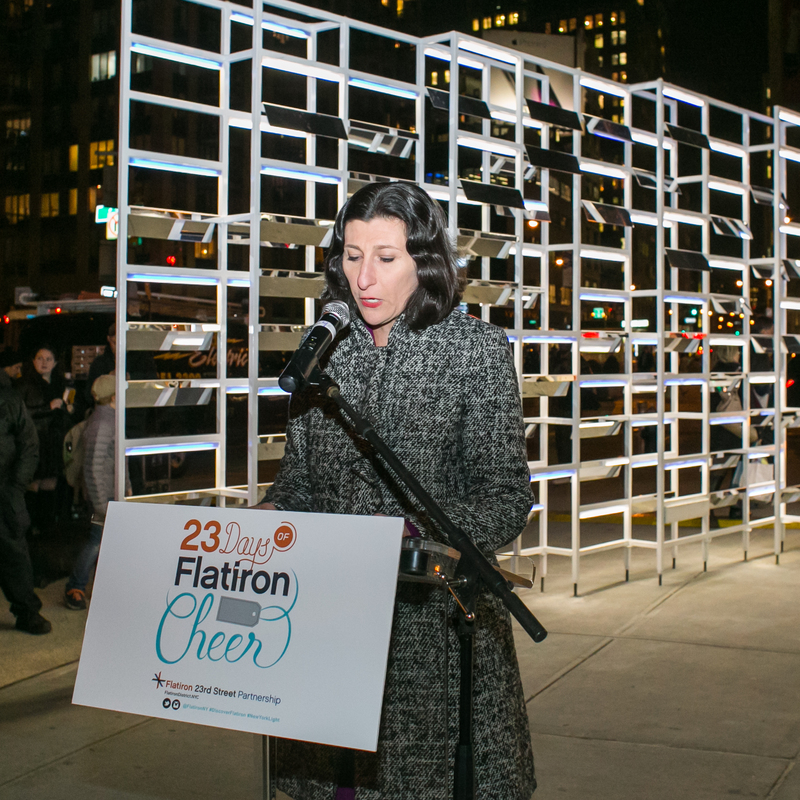 The weather was appropriately windy and wintry for the kickoff of the Flatiron BID’s annual holiday festivities, known as the “23 Days of Flatiron Cheer” on Monday. Public programming in the Flatiron Plazas will be back for the summer this June with free tech classes, fitness sessions, board games, crafting and other activities. The Flatiron/23rd Street Partnership Business Improvement District (BID) is launching the series with an event on the summer solstice, June 20, in partnership with the Museum of Mathematics, which is located on East 26th Street just north of Madison Square Park, and programming will officially begin the next day, running through August 11 on Tuesdays, Wednesdays and Thursdays. The kickoff event, held on the longest day of the year, will be a chance for the public to participate in some math-related fun. MoMath and the BID, with the help of willing volunteers, will construct a polyhedron comprised of 12 ten-pointed stars in the north public plaza. The angles on all the stars will correspond with the angle made by the sun at its highest peak at noon on the day of the solstice. Community residents and business owners in the Flatiron District are hoping to highlight the history of the neighborhood and provide more space for public activities at the neighborhood’s pedestrian plazas. They got to share their suggestions at a recent community workshop hosted by the Flatiron/23rd Street Partnership Business Improvement District on the future of the plazas, which stretch from 23rd to 25th Streets along Fifth Avenue and Broadway. The workshop was held last month at the Porcelanosa building on 25th Street. One attendee was neighborhood resident Jeanne Braun, who said the history of the area should be emphasized. “It should be made to look like a historic district,” she said. A new interactive art installation on the Flatiron’s north public plaza debuted last Wednesday evening, kicking off the holiday festivities in the neighborhood. “Nova” by SOFTlab was the winning submission in the second annual Flatiron Public Plaza Holiday Design Competition, held by the Flatiron/23rd Street Partnership Business Improvement District (BID) and Van Alen Institute, that called for proposals from design firms for a temporary holiday installation. SOFTlab, which also happens to be a local firm located on West 27th Street directly north, worked with materials from 3M to create the crystalline installation that acts as a sort of observatory for historical sites in the neighborhood. Viewing scopes positioned in different directions allow passerby to see the Flatiron Building, Met Life clock tower, Empire State Building and other landmarks through a kaleidoscopic lens and LEDs that activate within the structure enhance the effect. Madison Square Park is celebrating the 200th anniversary of the park’s naming in style this weekend with a historical fair and contemporary art party featuring period-themed activities and displays from the 19th and 20th centuries. There will be popular lawn games from the past 200 years set up throughout the park, including badminton/shuttlecock, croquet for both adults and kids, jump rope, marbles, hopscotch and a 1914-inspired dice game of hearts. The Museum of Interesting Things, which is a traveling interactive exhibition of inventions and antiques, will be at the event with a booth containing popular cultural items from the turn of the 19th and 20th centuries on display. Betsy, a Fifth Avenue Coach Company double decker bus that ran in Manhattan from 1931 to 1953 will be on display thanks to the New York Transit Museum and attendees will be able to check out the clothing and fashion from the early 1800’s and 1900’s in an exhibit from Leading Lady Costumes. There will also be a number of performances throughout the afternoon, featuring music, dancing and magic popular during the early 1900’s. The Mad. Sq. 200 Quartet is a string quartet with alumni from the Juilliard School and will perform popular classical music from the 1800’s. The Commonwealth Vintage Dancers will demonstrate some of the line dances popular during the early 1800’s and 1900’s, all while in full costume. The historic daytime fair will be Saturday, September 6 from 3 to 6 p.m., but after that until 9 p.m., the improvisational art organization known as TASK will be hosting an experimental, contemporary art party. TASK was created by artist Oliver Herring and participants follow two simple rules: write down a task on a piece of paper and add it to a designated TASK pool, then others take a task from the pool and interpret it any way they want, using materials and props provided. 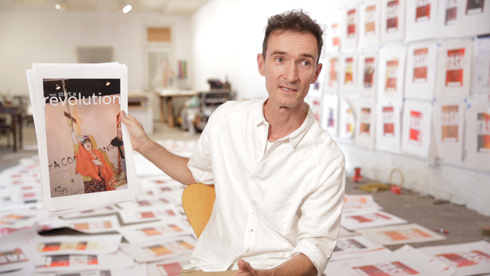 Madison Square Park Conservancy executive director Keats Myer recently spoke to the Flatiron 23rd Street Partnership about the fair and party. “This event is to honor Madison Square Park’s rich history, while also celebrating the diverse and vibrant community that makes the Park so special today,” Myer told the BID. This week the following, free events will be held outdoors in parks and other spaces open to the public. 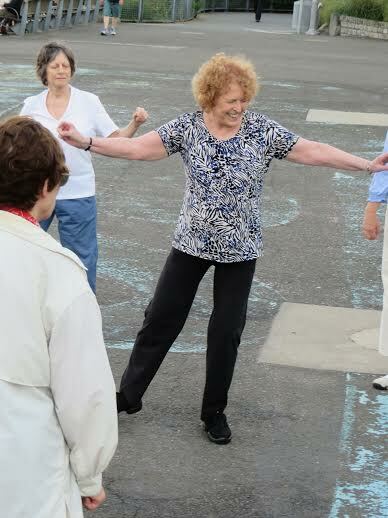 The Stuyvesant Cove Park Association presents an evening of folk dancing led by Christine Meyers. The session will take place on Saturday, August 2 at 7 p.m. at the park. No experience is necessary and all are welcome to attend regardless of age or fitness level. In the event of rain the event will take place on Sunday, August 3. Waterside Plaza presents the return of RCN-sponsored movie nights on the plaza throughout August. Films will be shown on August 4 (“Bend it Like Beckham”), August 11 (“Kung Fu Panda”), August 18 (“Moneyball”) and (“Invincible”) August 25 at 8 p.m. (dusk) each night. No rain date. Event is cancelled if it rains. Additionally, on August 16 at 8 p.m., Waterside will hold its first international food festival outside on the plaza. Event occurs rain or shine. For more information, contact Yenneca Ketzis at yketzis@watersideplaza.com. Films in Tompkins presents screenings on Thursdays throughout the summer in the park, presented by Howl! Arts. See the Films in Tompkins Facebook page for updates. 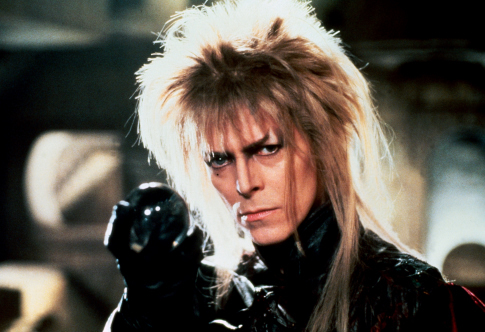 On Aug. 7, “The Labyrinth” will be shown. Madison Square Park Conservancy will conclude the twelfth season of Mad Sq. Music: Oval Lawn Series on Aug. 6 from 7-8:30 p.m., with a performance by Sister Sparrow & The Dirty Birds. Concerts take place on the Oval Lawn of Madison Square Park. The park is located at 23rd St. between Madison and Fifth Aves. Concerts occur rain or shine and are appropriate for the whole family. Visitors are encouraged to bring a blanket and picnic (no chairs allowed. For more information, visit madisonsquarepark.org. Theater for the New City presents “EMERGENCY!!! 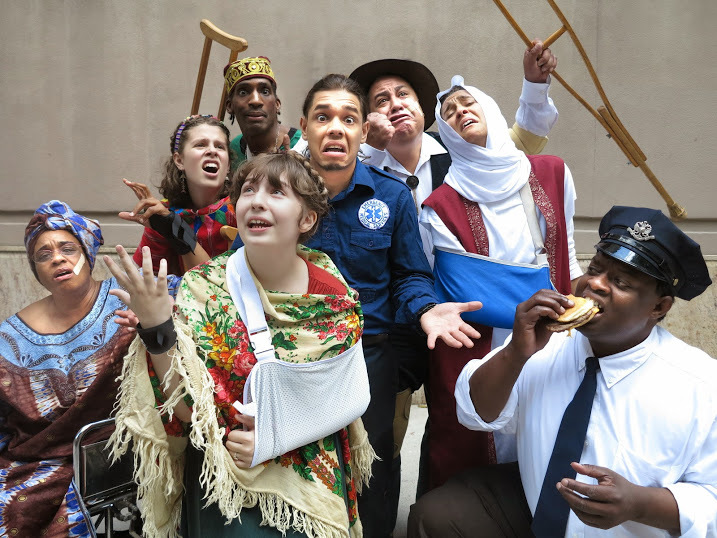 or The World Takes a Selfie,” a musical which will tour city streets, parks and playgrounds throughout the five boroughs from Aug. 2 to Sept. 14. The Sat., Aug. 2 show at 2 p.m. will take place in front of TNC, First Ave. and E. 10th St. The running time is one hour. Shows will take place at different sites in the five boroughs, returning to the East Village community for two performances in September. In this musical, a New York EMT worker is on a workingman’s grand tour of the world and decides to tackle global problems the way he does emergencies of his NYC beat. Every day, an EMT worker becomes inextricably entwined with the private lives of all kinds of New Yorkers, with all their personal crises. The hero of this play ministers to the widest variety of human beings, from vaudeville entertainers to ladies of the night to planet-saving protesters to occasional investigative journalists, one of whom makes him a sidekick for a worldwide expedition through trauma, violence, spying and accidental wars on a global scale. The music varies in style from bossa nova to hip hop to musical comedy to Gilbert & Sullivan. On three consecutive Saturdays in August, nearly seven miles of NYC’s streets are opened for people to play, run, walk and bike. Summer Streets provides space for healthy recreation and encourages New Yorkers to use more sustainable forms of transportation. In 2013, more than 300,000 people took advantage of the open streets. A rest stop along the route will be located at East 25th Street and Park Avenue South. Additionally, the DOT will be offering free bike helmet fittings on East 24th Street and Park Avenue South on Saturday, August 2 from 7 a.m.-12:30 p.m. Fittings will also be offered during Summer Streets on August 9 and 16. For details, visit nyc.gov/summerstreets. For even more events going on this week, including concerts, theater, kids’ events, art exhibits, burlesque and walking tours, see Town & Village’s Around & About section. To find out about free events taking place throughout the city, see our Cutting Corners section. For health related events, including free fitness classes, support groups and screenings, see Health and Fitness. For events and services being organized by local houses of worship, see Religion in the Community. In recent years, summertime in the city has become synonymous with concerts and other events at parks and neighborhood spaces, and the Flatiron District is no exception. However along with traditional events like fitness classes and outdoor theater, both of which are being offered in the Flatiron pedestrian plazas, the Flatiron/23rd Street Partnership (BID) is also bringing back another popular activity: tech workshops. For the past two summers, the Partnership has partnered with local company General Assembly to give classes on a variety of tech and business topics outside on the south plaza. 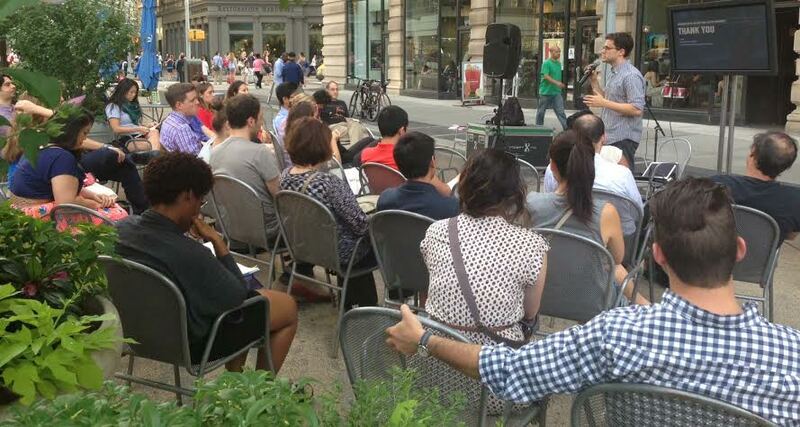 The first workshop in a three part series took place on Tuesday, July 8 and the remaining classes will take place on July 15 and 22 at the south plaza, located on Broadway between 22nd and 23rd Streets. On Tuesday, July 15 at 6 p.m., “Rules of Engagement: Moving Consumers from Awareness to Advocacy” is the scheduled class aimed at teaching social marketing strategy. On Tuesday, July 22 at 6 p.m. “Inbound Marketing Solutions: Marketing on a Budget” will focus on how to generate leads and improve traffic with a limited marketing budget. Jennifer Brown, the BID’s executive director, said the tech workshops were part of the organization’s mission of helping the local business community, which really got underway after the recession. So far the events have been a hit locally with around 30 to 40 attending when the weather is favorable. Sometimes people register in advance, but other attendees just happen to be walking by and sit down once they see what’s going on. As for the other programs, on Wednesdays, instructors from Flatiron fitness studios will be teaching exercise and yoga classes, sponsored by Athleta, on the south plaza. Upcoming fitness classes are: “Barreless Core Fusion” with Exhale on Wednesday, July 16 at 6 p.m. and “Shanti Flow with Yoga Shanti” on Wednesday, July 23 at 6 p.m.
On Thursdays, the Peoples Improv Theater (The PIT) will take the stage at the north plaza, on the west of Madison Square Park. House teams will perform a brand-new musical made up on the spot on July July 17 and July 24 at 6 p.m. each evening. PIT performers have worked the Flatiron plaza crowd before for holiday programs in December. Brown said the decision to offer fitness classes was inspired by similar seasonal programs now running at Union Square and Bryant Parks as well as the fact that the Flatiron neighborhood has become home to many fitness and yoga studios. “We’ve been talking about working with them for years now,” she said. The BID pays for its programming as well as its other projects like maintenance of the pedestrian plazas and beautification of the neighborhood. 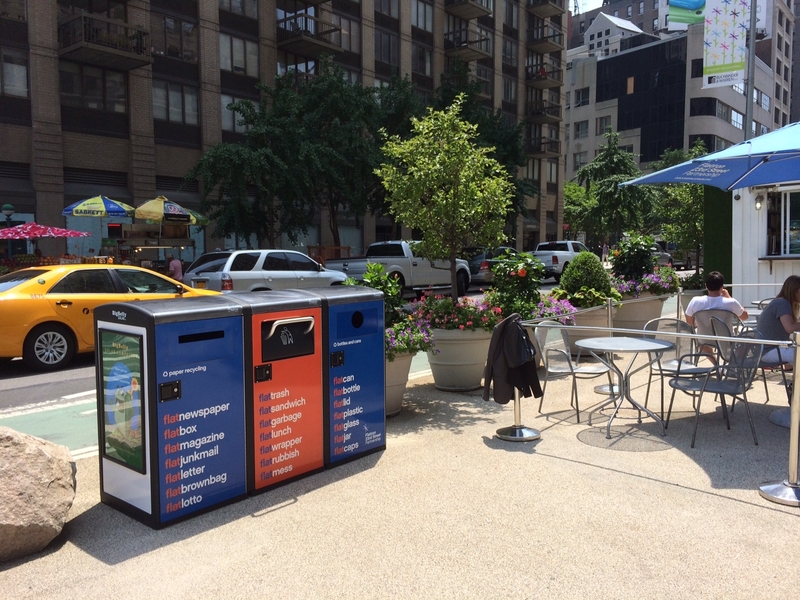 Tree pit guards were recently implemented throughout the district and three new recycling bins with solar-powered trash compactors were installed in the plazas, paid for out of a $350,000 annual budget as well as other revenue. The BID gets some income from two food kiosks on the plazas and also gets a fee, along with the city, when the plazas are used by companies for promotional events. If there’s a movie shoot, the BID will usually get some sort of voluntary monetary contribution. Most of the years since its creation though, the expenses have been more than what the budget allows for. But the expenses have also changed. Initially, the BID arranged for plantings twice a year. These days, it’s four times a year. Maintenance of the BID, handled by its own sanitation, public safety and gardening crews, is done throughout the BID district, the borders of which are 21st and 23rd Streets and Third and Sixth Avenues. For more information about the Flatiron Partnership’s events, visit http://www.discoverflatiron.org.